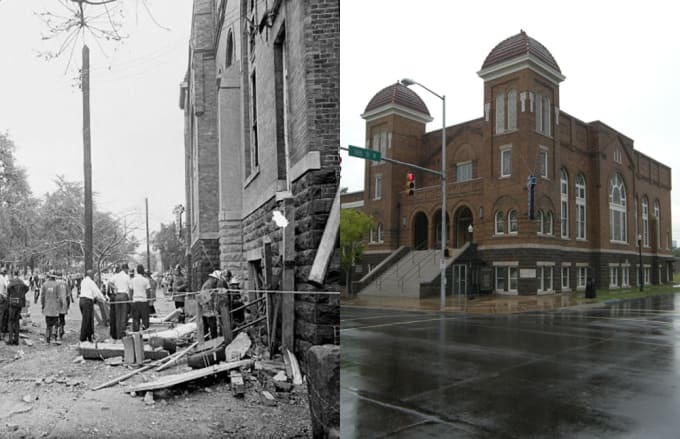 Location: 1530 6th Ave. North, Birmingham, Ala.
Birmingham's 16th Street Baptist Church served as a meeting place for civil rights activities through the spring of 1963, and leaders such as Dr. Martin Luther King, Jr., Ralph David Abernathy, and Fred Shuttlesworth also used the church as the meeting place. Early in the morning on Sunday, September 15, 1963, Bobby Frank Cherry, Thomas Blanton, Herman Frank Cash, and Robert Chambliss planted a box of dynamite with a time delay under the steps of the church, near the basement. At 10:22 a.m., 26 children were walking into the basement when the bomb exploded, injuring 22 people. Addie Mae Collins (age 14), Denise McNair (age 11), Carole Robertson (age 14), and Cynthia Wesley (age 14) were all killed in the attack. The tragedy brought national attention to racial inequalities in the South, forcing many to finally acknowledge the seriousness of the matter. In addition, it compelled President Lyndon B. Johnson to sign the Civil Rights Act of 1964, ensuring that all African-Americans had equal rights in the eyes of the law. In 1997, Spike Lee directed 4 Little Girls, a documentary about the incident that was nominated for Best Documentary at the 1998 Academy Awards. The church was named a National Historic Landmark in 2006 and still operates in the Birmingham Civil Rights District to this day.